Almeria is a province of great historical and cultural heritage, with places as contrasted as a golf course on the beach to the typical white villages in the Alpujarra Mountains and Sierra Nevada. If you visit Almeria, from malagacar.com we will recommend some towns to visit and which you can locate on the above map of Almeria. This small town located in the foothills of Sierra de Gador is a paradise for nature lovers and offers visitors a great heritage and monuments among which we highlight the Alcazaba of Villavieja and the Moorish remains. Located in the Almanzora River basin bordering with the province of Murcia. You can visit the Castle, symbol of the city. Birthplace of the river Andarax and a municipality with plenty of water. Located in the region of La Alpujarra the place has everything to be one of the favourite destinations for lovers of rural tourism. Beautiful town of Almeria where you can find the remains of the furnaces of the old mines and a Via Verde for hiking and biking and which links the station of Lucainena with Aguamarga. This white town located in Sierra Cabrera has an old town built and moulded to the contour of the surrounding land. Tourists who decide to visit will find interesting the Festival of Moors and Christians held every year, a historic recreation of great charm. This municipality is one of the largest in Spain and has the Natural Park Cabo de Gata-Nijar, a place to discover beautiful landscapes formed by sand dunes, coves and natural beaches, filming location for numerous films and where once there were gold mines. Quality of beaches and wide gastronomic offer in this popular and summery town of Almeria. Municipality known for their traditional sausages and hams. This village is situated on a hill slope of Sierra de los Filabres. Tabernas is a municipality known throughout the world for its desert and the many films that have been shot there, from famous American Westerns with Clint Eastwood to adventure films like Indiana Jones and the Last Crusade. Located at 1100 meters above sea level the town has a fresh and mild climate that offers clean air and large green spaces. An ideal place to discover nature in Almeria. 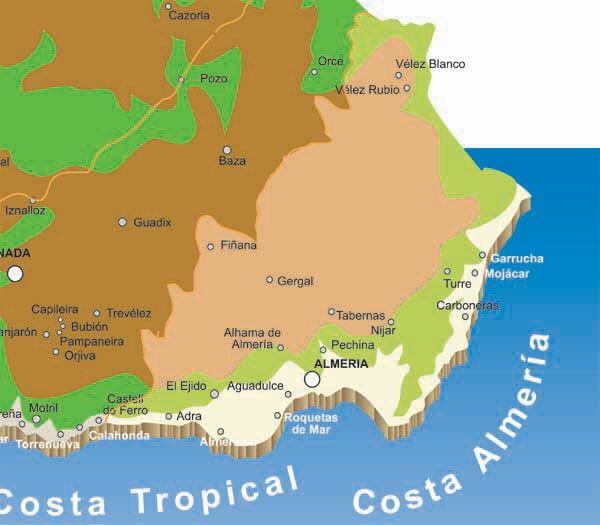 If you want to know more about the towns and villages of Almeria and other recommended places please visit our guide.